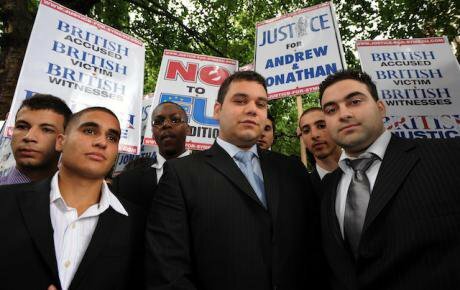 Andrew Symeou with supporters at extradition hearing in Westminster Magistrates Court, London, August 2008. Fiona Hanson/Press Association. All rights reserved. Whether you are a victim of crime, accused of a crime, or simply someone who believes in the value of fair play, we all have an interest in ensuring rights are safeguarded in the criminal justice process. When it comes to future policing and security cooperation with the European Union (EU), the UK Government has been singular in its focus on fighting crime. Headlines like ‘Brexit could lead to security threat’ and ‘Brexit will make it harder to bring foreign criminals to justice’ reflect the Government’s fears over maintaining policing and security arrangements and determination to maintain access to the full arsenal of cooperation measures. Theresa May has made it clear, for example, that she is determined to keep the European Arrest Warrant (EAW) – the EU’s fast-track extradition measure – after the UK leaves the bloc. At Fair Trials and Liberty, we have serious concerns over how new security cooperation may erode fundamental fairness and result in worse outcomes for the human rights of everyone living in the UK post-Brexit. The introduction of the EAW in 2004 heralded a new era of fast-track extradition across the EU, introducing strict new time limits for accused persons facing extradition and removing some of the previous barriers to extradition. However, this new era also brought about new problems: high profile cases of injustice began to emerge as people found themselves subject to this new kind of extradition. Take the case of Andrew Symeou, a British student extradited to Greece, where he spent 11 months in pre-trial detention in dreadful conditions. The case against him was clearly flawed, but British courts had no power to stop his extradition. He was eventually found not guilty, but the entire ordeal lasted nearly four years. He was eventually found not guilty, but the entire ordeal lasted nearly four years. Fair Trials and Liberty both campaigned for reforms, raising awareness of cases where extradition was unjustified, unnecessary and would result in serious human rights violations. Extradition has the power to destroy people’s lives and tear families apart – it should only be used as a measure of last resort. After determined long-term advocacy and campaigning, progress has been made. In 2014, the UK Government enacted reforms which gave new protections to people facing extradition under the EAW. These protections mean that where extradition would be disproportionate to an accused person’s human rights or where that person would have to face months of pre-trial detention abroad, judges have the power to halt the extradition. The Prime Minister has made no indication or commitment that she plans to hold onto these vital safeguards after Brexit. It would be a perverse outcome if leaving the EU resulted in more people being extradited to the EU – but that result is a possibility if rights protections are not put centre stage. While the UK has a historical reputation for good due process rights, the new procedural rights being rolled out across Europe risk leaving the UK lagging behind. In recent years, the EU has also become more sensitive to the need to protect the human rights of those subject to EAWs and European courts have shown an increased willingness to refuse extraditions on human rights grounds. EU efforts include the introduction of new cooperation measures limiting the use of EAWs. The success of EU policing and security cooperation is not only down to the arsenal of tools available to Member States. It is also down to the progressive rights framework underpinning it. Since 2009, the EU has been developing new human rights standards for suspects involved in criminal proceedings across Europe. These new standards, including access to a lawyer and the presumption of innocence, guarantee that suspects are protected by the same basic rights across Europe. The UK has a complex history when it comes to cooperating with the EU on security, and has often been criticised for adopting a ‘cherry-picking’ approach. These new procedural rights are no different – the UK only opted into two of the six EU laws. While the UK has a historical reputation for good due process rights, the new procedural rights being rolled out across Europe risk leaving the UK lagging behind. With Theresa May intent on protecting UK access to the EAW, the Government must commit to maintaining our domestic safeguards as well as insisting on the continued use of a range of EU security measures. Cooperation between the UK and its European neighbours is critical to ensuring that towns and cities across Europe are kept safe – but you don’t defeat the threats faced by the UK and the EU27 by sacrificing shared values, or by flouting human rights and the rule of law.